Yeah another CPC game project and yeah another platform shooter (I've near enough perfected my platform shooter engine so why not milk it to get some fun games out?). Guess I'm allowed a comfort zone for now. This is actually a fairly simple project intended as a test between me and my CPC coder buddy to sorta gauge how the 'porting' process is going to work before attempting the bigger games. This is also a way for me to use some old graphics from abandoned projects, restyled into the CPC's Mode 0. Was worried at first my style and using Mode 0 again would make it look too much like Cosmic Prison Commando but, as I hope you'll agree, it looks quite different. 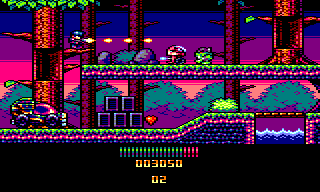 It's more cutesy traditional platformer type as opposed to the Turrican-esque C.P.C. It's supposed to feel a bit like a budget game you'd have bought on cassette tape for about £2.99 back in the day. Anyways the 'limitations' should mean I don't have any technical issues getting the PC version done which will be used to help build the real CPC version. Looks great man, I'm looking forward to anything you've got to release. I'm a retro game developer inspired by my favorite games of all eras whether on my old Amstrad CPC, Amiga and NES or my more modern PlayStations. I generally only use pixelled graphics in my game and ideally joypad based control (with keyboard support if a joypad isn't present) for a more authentic console feel on PC. If you're a generous sort and feel like making a donation you can do so by clicking this button. Any amount is appreciated thanks!